Download "SePem. Noise loggers for monitoring water pipe networks sturdy convenient reliable"
2 SePem sturdy convenient reliable Detect water losses early Leaks in water pipe networks can result in significant water losses. Thanks to systematic monitoring of the network with SePem data loggers, you can reliably identify existing leaks and catch new ones early on much faster than with conventional methods. 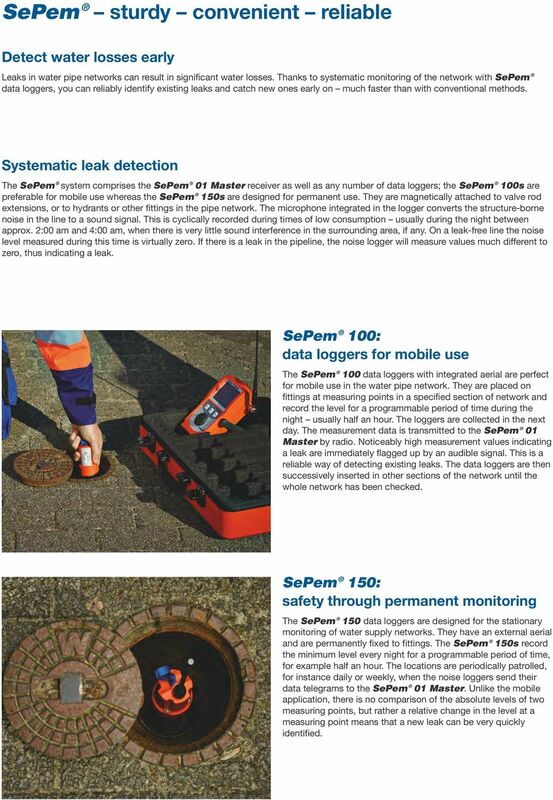 Systematic leak detection The SePem system comprises the SePem 01 Master receiver as well as any number of data loggers; the SePem 100s are preferable for mobile use whereas the SePem 150s are designed for permanent use. They are magnetically attached to valve rod extensions, or to hydrants or other fittings in the pipe network. The microphone integrated in the logger converts the structure-borne noise in the line to a sound signal. This is cyclically recorded during times of low consumption usually during the night between approx. 2:00 am and 4:00 am, when there is very little sound interference in the surrounding area, if any. On a leak-free line the noise level measured during this time is virtually zero. If there is a leak in the pipeline, the noise logger will measure values much different to zero, thus indicating a leak. 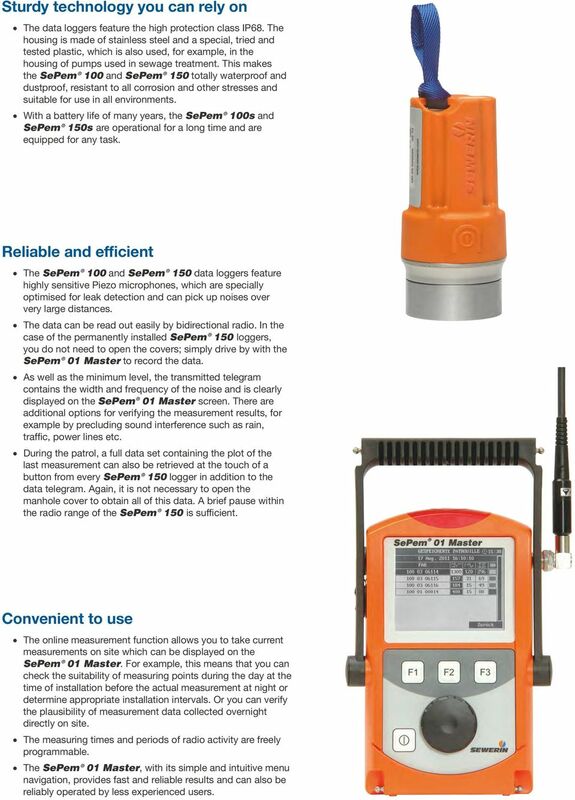 SePem 100: data loggers for mobile use The SePem 100 data loggers with integrated aerial are perfect for mobile use in the water pipe network. They are placed on fittings at measuring points in a specified section of network and record the level for a programmable period of time during the night usually half an hour. The loggers are collected in the next day. The measurement data is transmitted to the SePem 01 Master by radio. Noticeably high measurement values indicating a leak are immediately flagged up by an audible signal. This is a reliable way of detecting existing leaks. The data loggers are then successively inserted in other sections of the network until the whole network has been checked. SePem 150: safety through permanent monitoring The SePem 150 data loggers are designed for the stationary monitoring of water supply networks. They have an external aerial and are permanently fixed to fittings. The SePem 150s record the minimum level every night for a programmable period of time, for example half an hour. The locations are periodically patrolled, for instance daily or weekly, when the noise loggers send their data telegrams to the SePem 01 Master. Unlike the mobile application, there is no comparison of the absolute levels of two measuring points, but rather a relative change in the level at a measuring point means that a new leak can be very quickly identified. 3 Sturdy technology you can rely on The data loggers feature the high protection class IP68. The housing is made of stainless steel and a special, tried and tested plastic, which is also used, for example, in the housing of pumps used in sewage treatment. This makes the SePem 100 and SePem 150 totally waterproof and dustproof, resistant to all corrosion and other stresses and suitable for use in all environments. With a battery life of many years, the SePem 100s and SePem 150s are operational for a long time and are equipped for any task. Reliable and efficient The SePem 100 and SePem 150 data loggers feature highly sensitive Piezo microphones, which are specially optimised for leak detection and can pick up noises over very large distances. The data can be read out easily by bidirectional radio. 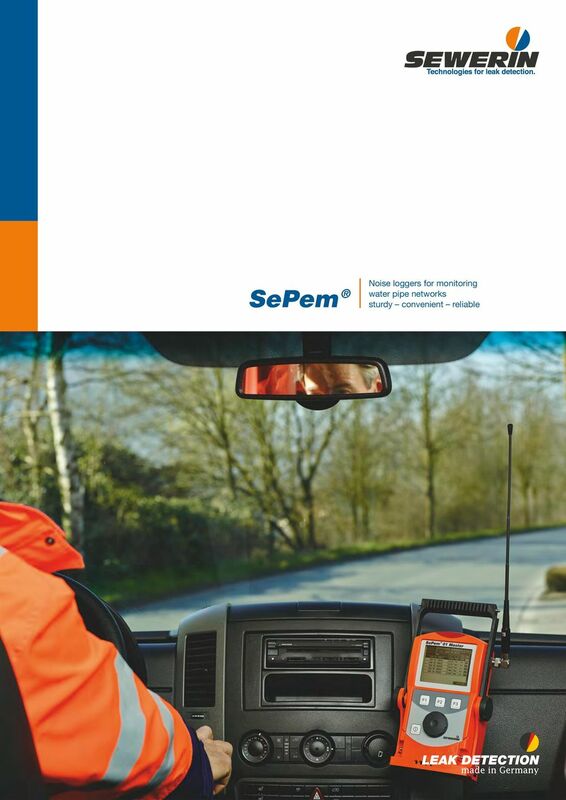 In the case of the permanently installed SePem 150 loggers, you do not need to open the covers; simply drive by with the SePem 01 Master to record the data. As well as the minimum level, the transmitted telegram contains the width and frequency of the noise and is clearly displayed on the SePem 01 Master screen. There are additional options for verifying the measurement results, for example by precluding sound interference such as rain, traffic, power lines etc. During the patrol, a full data set containing the plot of the last measurement can also be retrieved at the touch of a button from every SePem 150 logger in addition to the data telegram. Again, it is not necessary to open the manhole cover to obtain all of this data. A brief pause within the radio range of the SePem 150 is sufficient. Convenient to use The online measurement function allows you to take current measurements on site which can be displayed on the SePem 01 Master. For example, this means that you can check the suitability of measuring points during the day at the time of installation before the actual measurement at night or determine appropriate installation intervals. Or you can verify the plausibility of measurement data collected overnight directly on site. The measuring times and periods of radio activity are freely programmable. 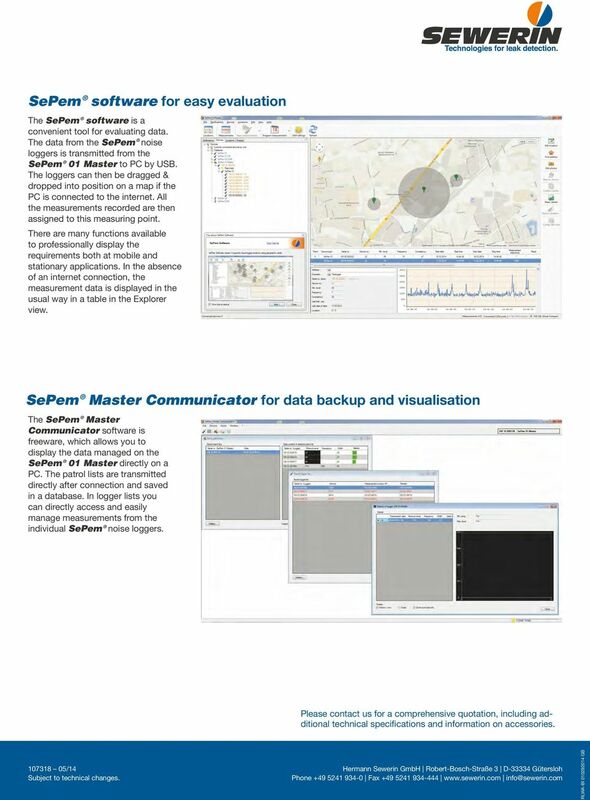 The SePem 01 Master, with its simple and intuitive menu navigation, provides fast and reliable results and can also be reliably operated by less experienced users. Correlator for the computer-assisted SeCorr 08 detection of leaks SeCorr 08 The handy and lightweight correlator for effortless work and listening to signals on the receiver suitable for use in all weather. AMP-300-EUR-serie. TRMS-stroomtangen voor motoronderhoud De moderne evolutie van de professionele stroomtang. Kenmerken van de. OUTDOOR HD BULLET IP CAMERA PRODUCT MANUAL GB - NL GB PARTS & FUNCTIONS 1. 7. ---- 3. ---- 4. ---------- 6. 5. 2. ---- 1. Outdoor IP camera unit 2. Antenna 3. Mounting bracket 4. Network connection 5. Hydrosteel 6000. The Hydrosteel 6000 hydrogen flux monitor is the ultimate portable tool for active sour, HF and high temperature corrosion. 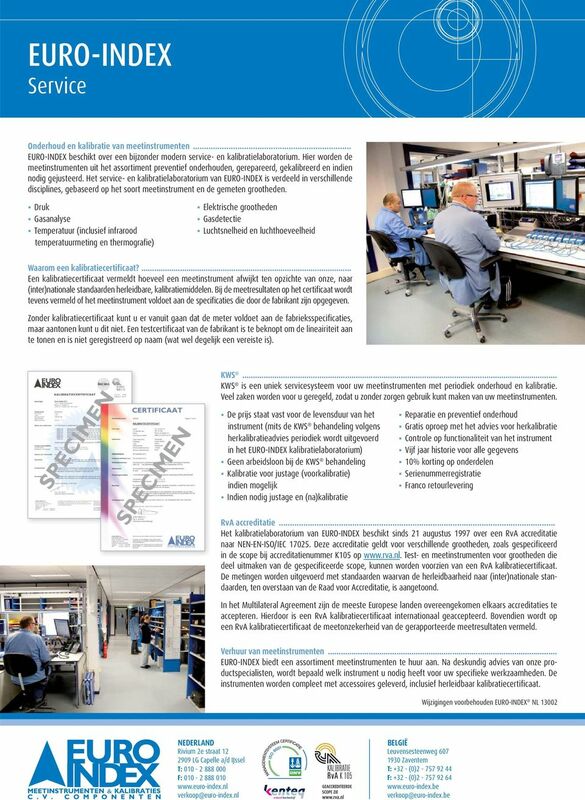 HANDLEIDING BLAUWE LIJN Afpersset tot 1 bar en Afpersset tot 10 bar INHOUD 1. DE DRUKADAPTER... 2 1.1. Functionaliteit... 2 1.2. Montage van de drukadapter op de S2600- en S4600-serie drukmeters... 2 2. T90/T110/T130/T150 Spannings- en doorbeltesters Robuuste, hoogwaardige testers geven snel testresultaten, op de manier die u het beste uitkomt Alle elektriciens zouden een tweepolige tester moeten hebben. BEKIJKEN. OPSLAAN. DELEN. Alle feiten, meteen op locatie. Met elke andere Power Quality Analyzer verspilt u slechts energie.